First follow-up by Seiichiro Kiyota. Nicely placed in the sky! Last edited by Paolo Berardi on Sun Mar 02, 2014 9:49 pm, edited 1 time in total. Hi all, we were able to observe the SN this night in a small window between clouds. We used Lhires III spectrograph with 150 l/mm grating, only 20 minutes total exposure. The spectrum confirms a reddened continuum and the strong sodium (D1D2) narrow absorption suggests an interstellar origin of these effects. 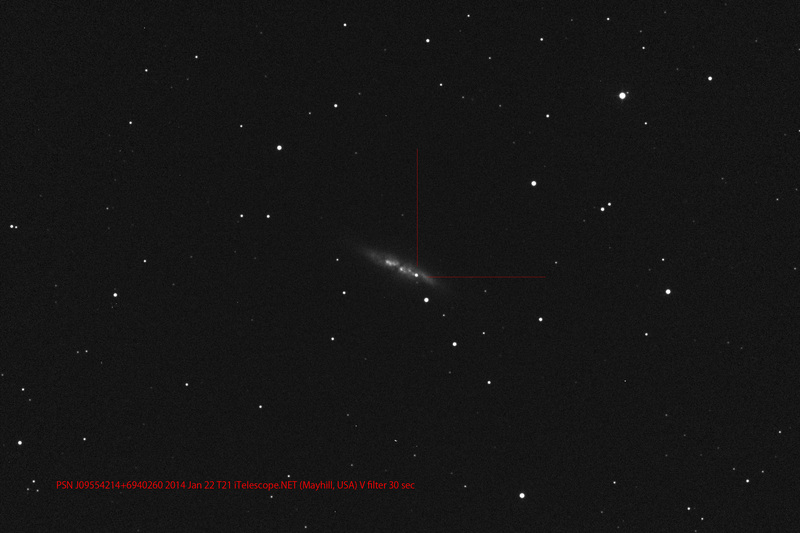 Spectrum on the supernova in M82 taken tonight with C11 + LISA, 30x3min. Clear but very damp conditions. A spectrum from tonight using a prototype high dispersion Star Analyser mounted in a filter wheel just 26mm from the camera sensor giving R~120 at 6000A. It confirms a reddened type 1a supernova. Fortunately that is not a normal situation from my observing site! Follows a comparison that shows spectrum evolution from 22 to 25 jan. Envelope expansion velocity derived from Si II minimum has decreased from about 14400 to 12800 Km/s. A similar trend (decreasing) seems to be shown by other absorption lines. Sorry for a such long post... I'm sending fit to François. the SiII line (6355A) is ~13900km/s while SII (5640)A gives ~12000 km/s. supported by the strong NaD features visible in the spectra. Very interesting Francois. I also got a good fit with SN 1997do if I simulate a de-redden from E(B-V)=1 (spectrum of 22 jan). Do ATel mention B-V, not IS reddening? The problem seems that there is an upper limit because the SN is already too bright, considering the distance, for an E(B-V) high value. Now the SN has reach about mag V 10.7. We hope continue to grow! *B-V=1.2 (instead of B-V~0 for a normal type Ia at the same epoch)"
here is my first spectrum of SN2014J.